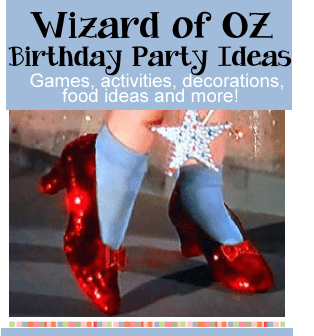 Ideas for Wizard of Oz invitations, decorations, food, icebreaker, games, activities, party favors and goody bags. 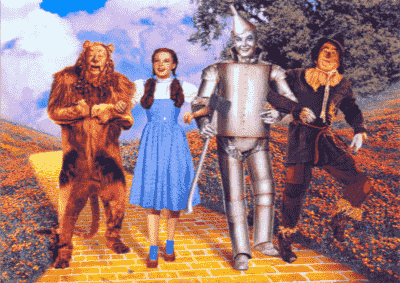 Follow Dorothy, the Scarecrow, the Tin Man, Cowardly Lion and Toto on a birthday party adventure! Party information can be printed onto big round stickers - CD style stickers work also - and place onto one side of a big 4" lollipop. (The invitation could read "We represent the lollipop guild, the lollipop guild, the lollipop guild...and in the name of the lollipop guild - we'd like to welcome you to ________'s party!" "Follow the Yellow Brick Road" to _____'s house for a Wizard of Oz birthday party!" "Somewhere over the Rainbow ... is _____'s party!" There are many different ways to decorate for a Wizard of Oz party. Starting outside - to greet the party guests as they arrive tie yellow or rainbow colored balloons onto the mailbox. Paint your walkway and sidewalk with yellow sidewalk chalk to look like bricks - use black chalk or charcoal to define the bricks. The party tables can be decorated in rainbow colors, or simpler such as a yellow table cloth with vases filled with lollipops or rainbow colored flowers. Or you could put down a blue and white checkered table cloth and set out vases of yellow roses or large yellow sunflowers. Red plates (the color of ruby slippers) would look great on the blue and white checkered table cloth. For place markers use 2" lollipops - print out the guests names on round stickers and stick to the lollipops. And/or you can attach rainbow colored helium balloons to a pair of red glittery shoes. Try these fun Wizard of Oz food ideas for your next Wizard of Oz party. Cotton candy (tornados) - rent a machine for more fun! Rainbow fruit - slice fruit in all the colors of the rainbow and lay out in rows. A fun way for the Wizard of Oz guests to get to know each other and break the ice at the beginning of the party. Guess how many candies are "over the rainbow" by filling a jar with rainbow colored candies. Guests put down their best guess of how many candies make up the rainbow in the jar. The one who is closest to the actual number wins! Piñata's are always a big hit with children at a birthday party. Choose a piñata shaped like a rainbow and use a broom (witch's broom) to hit it with. See our Piñata page for tips. Hire actors to come to the party dressed up as some of the characters from the movie. If you can't afford to hire someone check with your local high school or middle school theater arts group, or dress up your family and helpers! Make Ruby Slipper Flip Flops with our instructions and guide. Use red flip flops for every guest and use materials in reds, pinks, silver, gold or rainbow colors. Set up a Cupcake decorating station and let the kids decorate cupcakes. Set out bowls of fun candies such as skittles, jelly beans, chocolate chips, sprinkles, tubes of writing gel, marshmallows, etc. and let the children decorate their own cupcake. Make tissue paper lollipops. Cut out large circles from cardboard or heavy poster board about 5 - 6". You will need sheets of tissue paper in rainbow colors. Cut the tissue paper into 1.5" to 2" squares. Separate the colors into boxes or paper plates. Let them draw out a design on their circles to show them where to place the tissue paper. Have the party guests put a drop of glue onto the cardboard circle and then wrap a piece of tissue paper on the tip of their finger - then glue the tissue paper onto the cardboard. Make sure the tissue is glued close together so it will look full. Glue a 12" wooden dowel on the back. Or make tissue paper rainbows using the same method as above. Treasure hunt for Toto or the witches broom. Set up a treasure hunt filled with lots of clues and activities the guests have to do as they search for the hidden item. See our Treasure Hunt page on how to set it up. We like to have our treasure hunts take a long time (and so do the kids!) so we add in different tasks or games they have to complete before they get their next clue. Some fun ideas for a Wizard of Oz Treasure hunt would be to have the guests: sing a song from the movie, re-create the scene from Munchkin land with the Lollipop Guild, do a water relay (to pour on the witch) - see below, etc. You can play this game inside or outside. Party guests will divide up into two teams. Each team will be given two pieces of yellow paper or yellow poster board cut into 8 x 11.5" pieces. The guests will have to use the two pieces of paper to get to the other side of the play area and back by putting down one piece, standing on it, then putting the next piece in front of them and stepping on to it. They will then take the first piece and place it in front of them and continue around a marker or cone at the end point and back to their team. Once they are back then the next person in line does the same thing. Set up an obstacle course for the Lion using items that are found in the backyard such as trampolines, swing sets, large cardboard boxes, hula hoops, etc. Divide into 4 teams (Lion, Scarecrow, Dorothy and Tin Man). Cover empty tin cans with construction paper (or something similar) and stack them pyramid style on a table. Place a mark about 10 feet or more away from the table where guests will have to stand to try and knock over the tin cans with apples. Use real apples or fake ones. Create a tin man sculpture out of foil and cardboard and hang on the wall. Draw a heart shape on the Tin Man with a black marker. Give each guest a 4" heart that you have cut out of red paper and place a piece of double sided style tape on the back - either write their name on their heart or give them a number so you will know who's is who's. Blindfold the guests one by one and see how close they can get to placing their heart to the Tin Man's heart. Fill two big tubs and two smaller containers, that are the same in size, with water. Kids will try and fill up their teams container first using a sponge, spoon or cup (with holes in the bottom) in a relay style race. Small baskets like Dorothy's basket in the movie. Blue and white checkered material (or bandanas) tied around party favors.